A depleted Fleetwood side couldn’t upset the North Lancs/ Cumbria League leaders in this final home game of the season. As coach Steve Woodburn made his first appearance of the campaign, the Salford side dominated the early stages. However, Fleet had the first chance to put points on the board but full-back Gavin Rowell nudged a penalty wide. After successive scrums deep in Fleet territory, Della scored their first try which was converted. Their second try followed a penalty attempt which rebounded off a post. Fleet flanker Jordan Brocklehurst gathered the ball but lost possession running out of his 22 to gift the visitors a run to the line to double their lead. Della took control with their stone-wall defence, and although Fleet had sustained pressure towards half-time a third converted try made it 21-0 to the visitors at the break. The lead was extended further with a penalty in the first minute of the second half, but Fleet finally got on the scoreboard when a good team move ended with prop Pete Benny taking James Lilley’s pass to crash over, Rowell adding the goal. Another Della penalty struck an upright and Fleet had Scott Richardson sinbinned for not releasing in the tackle. The 14 men continued to play expansive rugby and were rewarded when Mike Kelly’s try cut the deficit to 24-12. Fleet’s comeback hopes were dented by two further yellow cards, to Woodburn and Brocklehurst, and Della scored the crucial next try from a scrum. 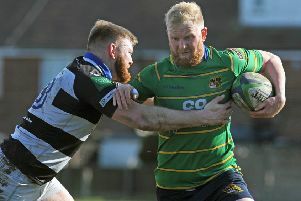 Karl Bowling’s late try revived home hopes but Della held firm against a series of Fleet attacks but still need to beat Keswick this weekend to take the title. Fleet slip to 10th but can take encouragement from outscoring and outplaying the leaders in the second half despite the sin-binnings. Lilley was man of the match for Fleet, who conclude the season at Oldham on Saturday, when supporters will be welcome on the team bus.